Ways to keep bugs away during an outdoor run makes me one step closer to actually complete a run in the woods. Bugs are one of my major fears when it comes to overthinking an outdoor workout. In my mind, stinging flying insects just cannot wait to fly up my shorts and sink their stingers into my skin multiple times. I worry about eating bugs, inhaling bugs, getting bitten, getting stung, contracting a horrid insect-transmitted disease, and coming home with a tick embedded in my body. Those are just a couple things I’m scared of when it comes to bugs and an outdoor workout. I also acknowledge the fact that I am entering the bugs’ house when I venture into the woods. It’s like wading into the ocean and getting mad at the jellyfish for stinging you. You’re technically the one invading their space, so respect nature. 1.) Proper clothes – Workout clothes are typically tight and fit to your body. This isn’t just to show off the goods. When you’re exercising, you don’t want extra clothing flopping around as a distraction. As a bonus, the tight clothing prevents bugs from flying up and under your clothes. Many workout clothes also wick away moisture. Bugs like the smell of your sweat. If my thought process is correct, sweat-absorbing fitness wear helps trap the scent. 2.) Avoid perfume – Skip your heavily scented body wash and save the lotion for later. Unless you are applying scents that repel bugs, anything floral or fruity will attract them. 3.) Area awareness – Know your area. Here in the Midwest, ticks are a huge problem. The tick population seems to grow every year. We have our dogs on year round prevention but don’t forget yourself. My human sister had a tick on her after a day of gardening. Stay in the know about any nasty insects creating havoc in your hometown. 4.) Natural repellents – There are tons of DIY bug sprays out there that use mixtures of essential oils to ward off bugs. There seems to be a recipe for each type of insect. I usually dab a bit of peppermint oil on my wrists, back of my neck, and bottom of my shirt before heading out. 5.) Chemical bug spray – You know, sometimes you have to call out the big guns. I’m all for natural methods, but sometimes harsh chemicals are what gets me out the door. Yes, I fear bees and wasps more than deadly chemicals on my body. It doesn’t have to make sense. If I am headed to a heavily wooded area for a workout, it’s time for a spray-down. 6.) Run in the morning – Get your workout out of the way first thing instead of battling extra bugs during the evening hours. 7.) Cover your face – “It’s just a little extra protein” says my dad as I swallow the fly that propelled itself right to the back of my throat. I am zero percent okay with ingesting insects. I know it happens, but I don’t need to be aware of it. I’d also like to keep them out of my lungs. When I think about all the tiny creatures I breathe in during an aerobic run, it makes me want to stay home and on the treadmill. 8.) Run faster – If you see one of the giant clusters of gnats, try to burst right through it. The swarm usually doesn’t follow. 9.) Stay on the trail – There are so many reasons to stay on a path while running in the woods and bugs are a big one. If you head into tall grass or weeds, you may as well serve yourself on a platter. 10.) Be prepared – Do you know if you’re allergic to bee stings or any other bug bite? If you’ve never been stung, you probably don’t know. Talk to your doctor about it, but at the very least bring a tiny first aid kit with you on a run. READ NEXT: 5 Reasons to Fear a Run in the Woods! 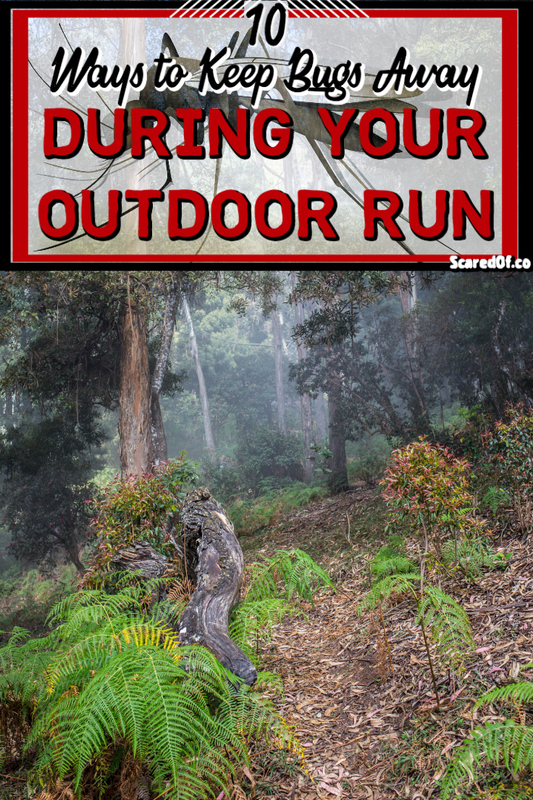 Do you know any more ways to keep bugs away during an outdoor run?